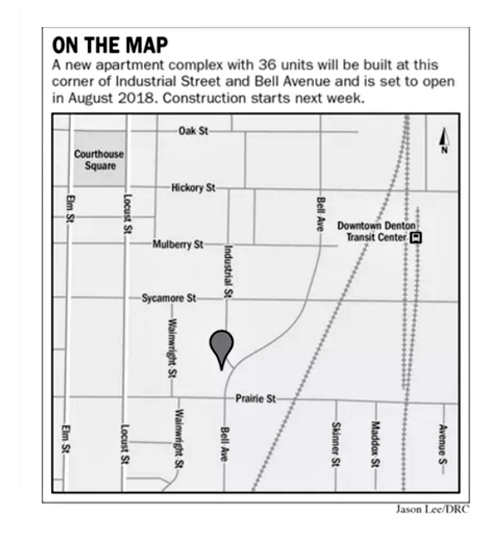 ​​​​​​​ DENTON – A planned apartment complex in Downtown Denton at Industrial St. and Bell Ave​.​ will be four stories with 36 apartment units—16 studio, eight one-bedroom and 12 two-bedroom apartments. Construction on the 404 Industrial Apartments is expected to begin mid-July 2017 with an expected opening in August 2018, and is expected to cost $4 million​ according to TDLR. The apartments are designed to be slightly upscale, with stained concrete flooring and quartz counter tops, and a mainly brick exterior. ​Chec​k out Dallas-Fort Worth-Arlington Multifamily Market Research.